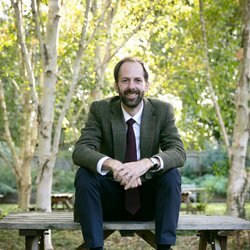 In September 2019 David Yeomans will be succeeded by Daniel Pounds, who was previously Head of Geography. Daniel came to Winchester from Bedford School in 2003. He has previously acted as Assistant Housemaster in Turner's and was Master in Charge of Rowing. Daniel coaches the Under 15s football team and leads mountain-biking. Daniel is married to Abigail, a modern linguist, and has three young children. He is a keen cyclist and enjoys morning runs with his eldest children and the family dog, Elsa.